@FM: I think the prospects of Ford are looking up. The wreckage of GM and Chrysler must have put the fear of Godverment in them, the flexibility to build what they want gives them more agility in the industry, and lots of "Buy American" conservatives will never buy Chrysler or GM again. Others are bullish on Ford, too. 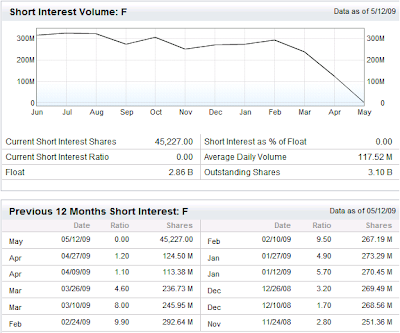 Their short interest, as reported on Yahoo, went from 124.5M in April to 45k in May. Four orders of magnitude... I'm wondering what the story is there and whether that's a typo. Here's a graph. Update: Some readers may not know what short interest is or what it tells us. Everyone's familiar with the adage: "buy low, sell high." That's how you make money on a long position. A short position reverses the timing: "sell high, buy low." How can you sell something you don't have? Well, your broker borrows the shares for you. Your brokerage account shows a negative number of shares until you "buy to cover your short position." If everything goes according to plan, you make money. I think the change in Ford is important, because short interest was almost 300M for a long time and then fell to 45k over the course of a few months. Savvy investors, or at least investors who short stocks, decided en mass that they could no longer expect Ford's share price to go down. Some might argue that this was a long drawn out short squeeze and maybe it was. Still, market sentiment is more favorable towards Ford Motor Company than it has been for quite some time.